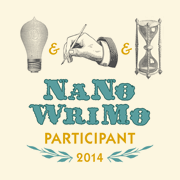 NaNoWriMo starts tomorrow, so I won’t be frequenting Twitter and this space as often as usual. I hope to check in with weekly updates. If you’re participating this year – good luck. If not, happy writing either way.